When the epigenetic reprogramming process is defective, the consequences in adulthood can include obsessive-compulsive-resembling behaviors, Emory scientists have shown. 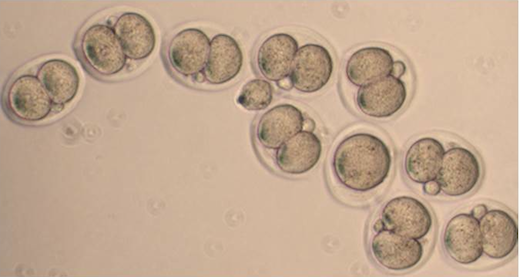 Photo of one- and two-cell mouse embryos courtesy of Todd Macfarlan. When the process of epigenetic reprogramming is defective in mouse development, the consequences in adulthood can include abnormal repetitive behaviors, Emory scientists have shown. Their findings are published online in the journal eLife. Katz and graduate student Jadiel Wasson created genetically engineered mice that have KDM1A missing from their oocytes (or egg cells), but present later in development. They teamed up with Todd MacFarlan, PhD, previously at the Salk Institute and now at the National Institute of Child Health and Human Development, to examine several mouse strains with alterations in the KDM1A gene. "These mice have functioning KDM1A later on in development, because they inherit a good copy of the gene from their fathers," Macfarlan says. "But it’s not there at a critical stage -- what we call the maternal-to-zygote transition." In the situation when egg cells are missing the KDM1A enzyme completely, much of the pre-fertilization information present on histones persists after fertilization. That means thousands of egg- and sperm-specific genes are turned on that shouldn’t be, and a similar number needed for embryonic development are turned off. "Usually, that’s lethal," Katz says. "The fertilized egg can’t tolerate it at all, and is unable to divide beyond the two cell stage." To study KDM1A’s role in brain development, Katz and Macfarlan are planning to create and examine mice that have a less drastic reduction of the KDM1A enzyme in oocytes, so that more survive to adulthood.